Clothing, accessories; fairtrade, organic, ethical sourcing, carbon neutral. Based in VIC. Hats, belts. Based in NSW. 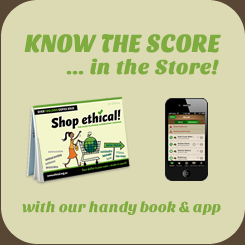 Ethical design market, online store. Based in AUS. Clothing from pure hemp, organic cotton, hemp cotton, hemp rayon, bamboo cotton and soy cotton. Based in Silverwater, NSW. Shoes, T-shirts, clothing; fairtrade, organic. Based in VIC. European online retailer, best practice in supply-chain transparency. Based in Belgium, EU. Fairtrade certified & organic cotton t-shirts. Carbon offset, charitable giving. Based in AUS. Hemp, silk, linen and cotton clothing. Based in Byron Bay NSW. Jeans and tops; organic, fairtrade, recycled materials. Based in Netherlands. Hemp clothing. Based in Blue Haven, NSW. Handmade online market. Based in NSW. Hemp clothing. Based in Margaret River, WA. Non-mulesed wool products under brands: nu�, Balanced ZeroC02 Wool, Tasmanian Merino, and Great Cape Merino. Based in VIC. Features: W.R.A.P certified, Made in Australia, Some stock Organic. Social enterprise. Designs read differently in the mirror to quite literally cause people to "Stop and Reflect". Designs spark conversation and promote positive values. $3 from every purchase is donated to development projects. Screenprinted in Brisbane with enviro friendly (water soluable) inks using 100% renewable energy. All clothing is W.R.A.P certified, and Made in Australia. 20-30% of the shirts we stock are Australian made Organic. Based in QLD. Pre-loved fashion market in Melbourne, Sydney, Adelaide. Based in AUS. Organic fibres, made in Australia. Based in Bondi junction, NSW. Fair trade and sweat-shop free, hand loomed organic cotton, thread is dyed using natural dyes, and loomed into fabric, no pesticides are used in the process of growing, dyeing and looming this fabric. Based in QLD. Clothes Swap events. Based in Melbourne, VIC. Fairtrade certified. Based in Kinross, WA. Features: Ethical Clothing Australia accredited, non-mulesed wool. Australian owned and made wool garments. Online store. Based in NSW.